Enjoy world class hospitality at Hong Kong Disneyland Resort hotels with international dinner buffet at Enchanted Garden Restaurant or Chef Mickey. Savor classic dishes from Chinese, Asian and Western cuisines and more. Your favorite Disney characters may show up at Enchanted Garden Restaurant any time - so ready your camera to capture the memorable moment! How better to supplement your scrumptious buffet than a visit from your favorite Disney friends? Remember to bring your camera to capture this memorable moment with your love ones! Be prepared for the time of your life when your favorite Disney characters stop by your table at Enchanted Garden Restaurant. You never know who will show up! Looking for something beyond your favorite Disney’s friend’s usual look? Come and meet Disney Friends in explorer costumes in Dragon Wind. Team up with these explorers and set on an expedition into the world of taste, and take a photo to remember the shared adventure. Say hello to the most famous celebrity chef of them all at Chef Mickey! Mickey Mouse is happy to step away from his busy duties in the kitchen to personally welcome you to his restaurant. Young guests joining us for Character Dining may even get a complimentary chef hat personally signed by Chef Mickey! 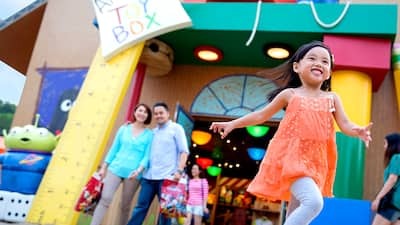 A dedicated gateway makes getting to the Park easier than ever – exclusive for guests staying at the Hong Kong Disneyland hotels! Step into the world of Anna and Elsa as you open the door to the Frozen Suite. Stay in a Frozen Suite at Hong Kong Disneyland Hotel to experience your own Frozen story! This offer is valid for check-in dates from January 2, 2019 to September 26, 2019 with check-out date on or before September 27, 2019, except for January 1, February 4 to 7, February 14, April 4, April 18, April 22, April 30 to May 1, May 13, June 6, July 1, September 30 and all Fridays, Saturdays and Sundays in the offer period which are block-out dates. Guest may cancel or amend the reservation at least 3 days prior to the check-in-date, except for, February 8 to 9, July 25 to August 20, 2019; in which case cancellation or amendment has to be made at least 7 days in advance. Amendment of reservation is subject to availability and Benefit Limits, and no change is permitted after the prescribed period stated above. Enjoy savings on your stay with a dinner buffet!